Following up on my last entry, I’m going to take this opportunity to post a couple of my entries that were axed from Ms Mandelman’s blog. They were such wonderful pieces of literary genius, it would be a shame to let them rot on my hard drive 😀 Unfortunately I didn’t save them all. Enjoy! The reason that people who are pro-gun bring up the idea of disarming an entire populace is quite simple. Many pro-gun types are students of history. And history has shown us that firearm registration invariably leads to firearm confiscation – look at Hitler, Castro and Mao to name just three. History has also shown us that bans never work. The war on drugs and prohibition immediately spring to mind. Registering firearms to reduce domestic violence makes about as much sense as registering needles to reduce international drug trafficking. It’s logic 101 Ms Mandelman. Just because all women are human, it doesn’t necessarily follow that all humans are women. Just because guns are sometimes used in cases of domestic violence, it doesn’t necessarily follow that domestic violence is dependent on the gun. Half a million people a year….I’m assuming that’s globally. Considering that approximately 60 million people die worldwide each year, that accounts for about 0.8% of all deaths each year. Heart disease takes over 7 million people (12%). Stroke another 4 million (7%). Respiratory infections (including TB) claims about 8 million people globally each year (15%). Road traffic accidents account for 1.5 million deaths a year. That’s fully 300% more deaths than caused by small arms each year. It would seems to me that cars – not guns – are the real weapons of mass destruction. 1,000 people die worldwide per day because of gun violence. If you’re unable to grasp the fact that this equates to a HUGE problem because you’d rather fight for what you think are your inherent rights (which FYI-gun ownership is NOT in Canada) then help end the illegal trade of guns through registering yours, which you own legally, then I don’t what else I can tell you. You clearly put your own self interests above anything else, like helping to keep society safe and preventing more refugee camps from having to be erected in places like Somalia. Of course I put my own self-interests above anything else. So do you. So does every person on this planet. If you don’t nobody else will do it for you. You’re correct. In Canada we don’t have a right to own a gun. In fact, in Canada we have absolutely no property rights whatsoever. We don’t technically “own” anything. The government could take our home away from us with absolutely no compensation if they felt like it. But we do have a right to self defense. And I will use whatever means are at my disposal to exercise that right. 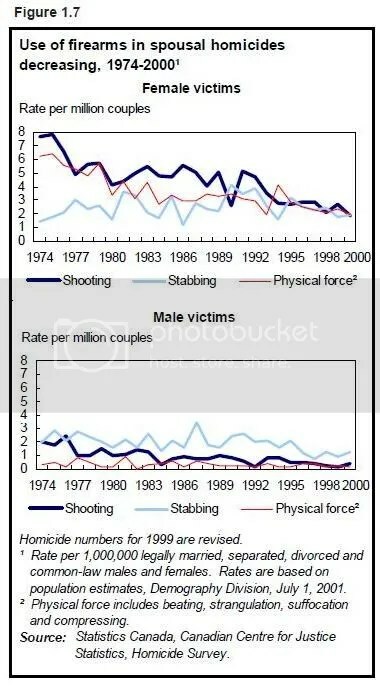 And statistics show that in a structured society, when citizens are armed the crime rates are lowered dramatically. Just look at Washington, DC if you’d like proof – they lifted their handgun ban last year and homicide rates in the city have plummeted. I understand your drive to help others. I just think your efforts are misguided. Registering every gun is an impossible and pointless mission. I’ve been to war-torn countries in Africa, the Middle East and Asia. I’ve seen first hand how things work there. Removing the illegal guns will not stop these wars. If they can’t get guns, they’ll resort to machetes and spears. But the wars will still continue. If you haven’t noticed it yet, I love statistics And I’ve got the perfect one for you today. Aside from the cost, another issue of the registry is security. Are you aware that the registry database has been hacked dozens of times since its inception? That’s right, a database that has the address of every legal gun owner in the country, as well as an itemized inventory of which firearms each person owns has repeatedly been breached. In my world, that’s one hell of a public safety concern. On top of that, the database is so flawed and inaccurate, that the information it contains is inadmissible in a court of law. If Detective Hawes finds it useful, well good for him, but he’s one of the very few police officers in this country who does. And I’ll just finish by saying this: in the video clip that you’ve included, everything that Detective Hawes said about gun control had to do with licensing not registration.